Mozilla plans to make a bunch of changes in the next two versions of the Firefox web browser, and users who are running either the beta or aurora version of the browser right now get a taste of those changes already. One of the changes is a new home page. Firefox users should not confuse this page with the homepage that they can set freely in the web browser though. 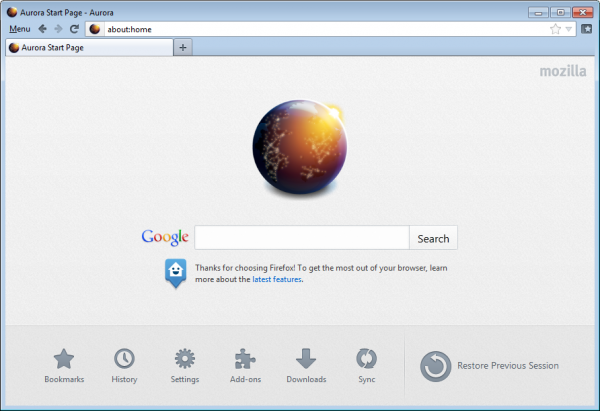 The home page is displayed to new users who install Firefox for the first time on the system, when you enter about:home in the browser’s address bar, or automatically when Firefox is configured to load that page on start up. The new home page displays a Google search form prominently in the center. There does not seem to be an option to modify the search engine at this point in time, but it is likely that add-on developers will find a way to replace it. Below the search is a link to the latest features of the browser which can be useful to find out what changed after an update. All of these options are accessible elsewhere as well, and it is likely that most advanced users won’t find a lot of use in the new home page of the browser. Inexperienced users on the other hand may find it more useful. Especially the option to restore a previous session comes in handy, when they have configured the browser to load the about:home page on new start and not the last session automatically. What’s your impression of this new Firefox feature?